Early morning on a Yucay street. Yucay is a village located along the river road about halfway between Pisac and Ollantaytambo, and one that many tourists pass through without a second look. 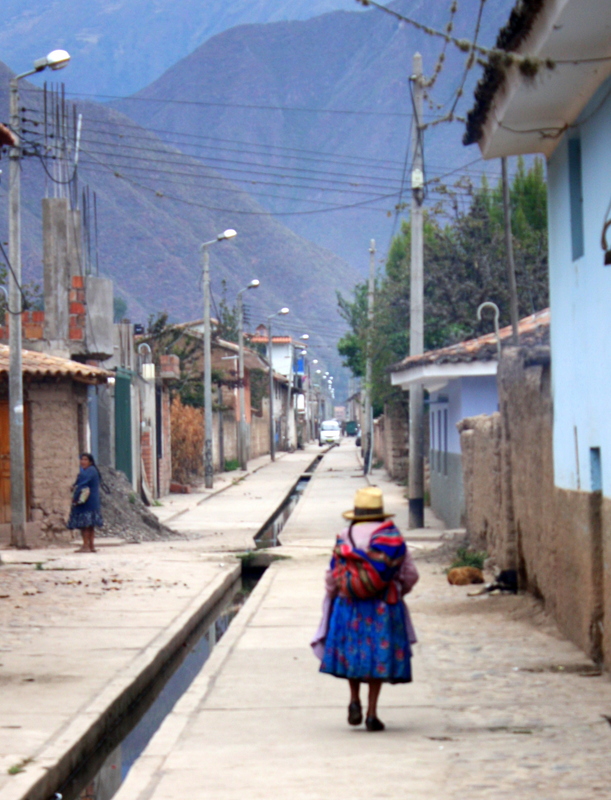 With plenty of time until Peru Rail departs for the Machu Picchu station, a stroll through its streets promises a richer glimpse into daily life in the Sacred Valley. There’s a slight chill in the air on this early Saturday morning. The village sits in the shadows of the ever-present mountains, and the sun has not yet broken through the clouds that hover and swirl hypnotically about their peaks. The first person to appear on the waking streets is a woman in colorful native dress, an improbably large load wrapped in the brightly colored blanket slung across her back. It’s a sight that will repeat itself countless times on this trip. Man and mule… both with backpacks. 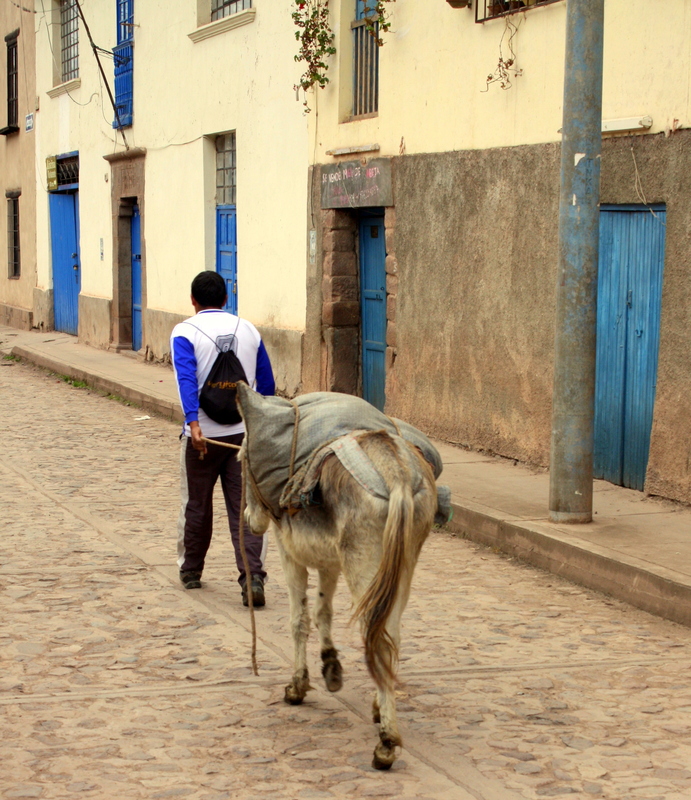 In the next block, the sound of mule shoes on pavement pace out the route of a man leading his beast off to a day of labor. There’s hardly a car to be seen in the village. 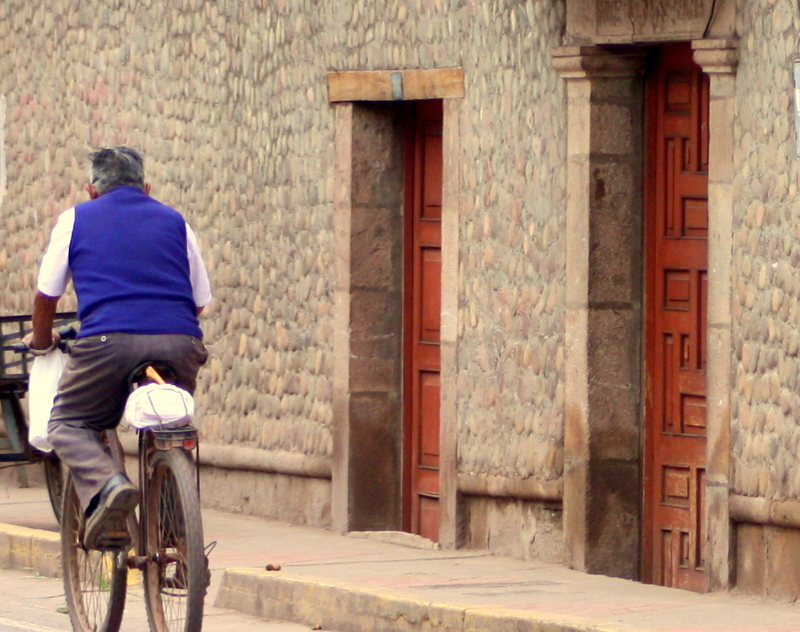 Another man passes on a bicycle, a small sack of groceries dangling from his handlebars. There is hardly a car parked on these streets, and I wonder how far these people have ever traveled from home. It can’t be a grocery without an Inca Kola sign! 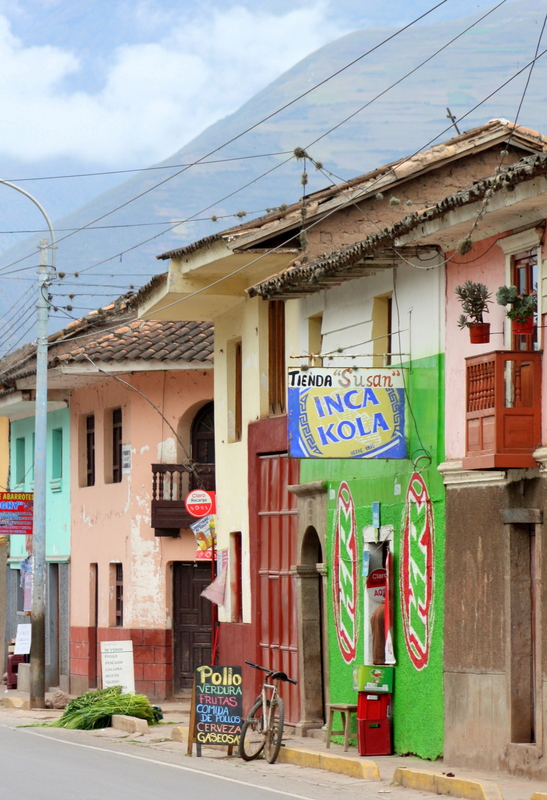 The ubiquitous Inka Kola signs hangs from a signpost in front of a neighborhood grocery store, a reminder that – incredibly – I’ve seen no Coca-Cola signs since entering the Sacred Valley. Home on Yucay’s main street. The colors of the homes are warm and inviting. 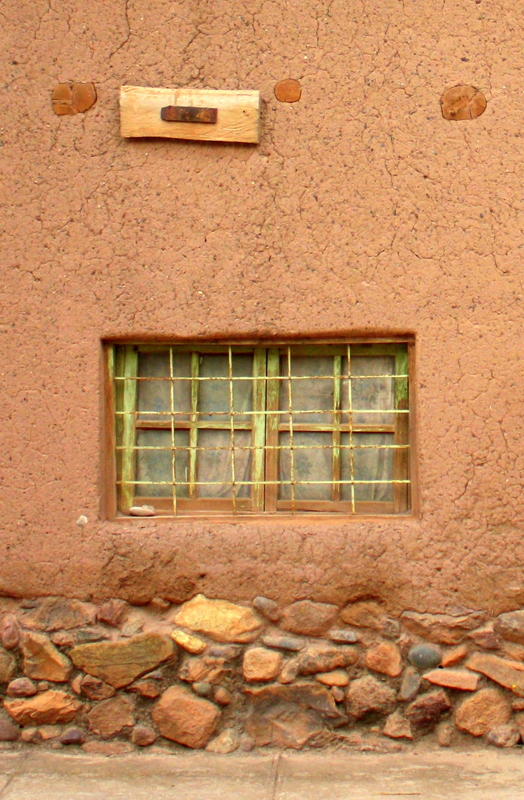 Sun-baked stucco in ochres and beiges. Old adobe brick with bits of straw poking through the surface. Home along Yucay’s main street. 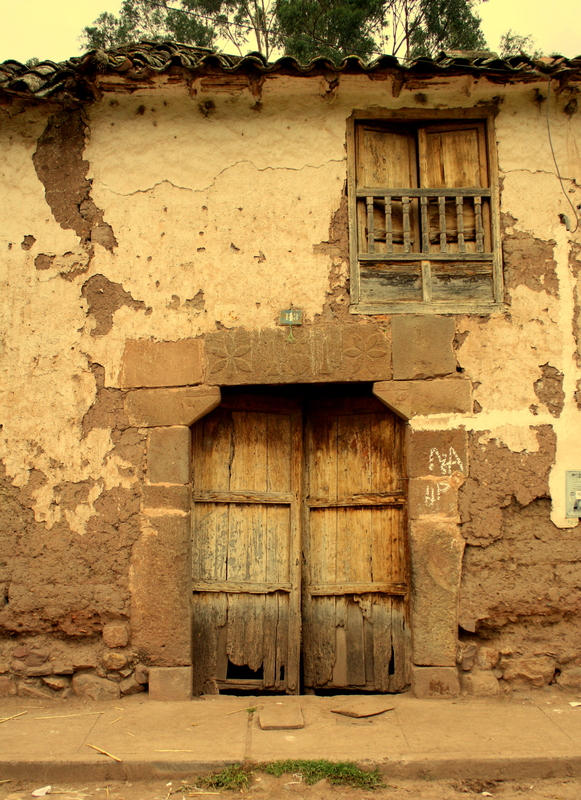 The oldest homes have been here for more than a century. 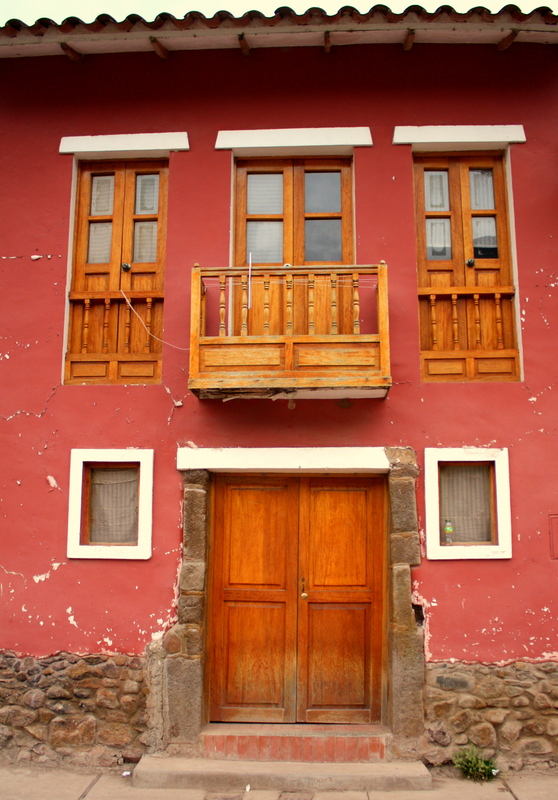 Everywhere richly stained wood is fashioned into windows, doors and balconies that imitate the Spanish Colonial style. They recall for me the villages of New Mexico around Santa Fe. Breakfast is on and the neighborhood begins to stir. The aroma of a simmering guizado begins to drift from curbside kitchen, and waking villagers begin to gather around them for breakfast. 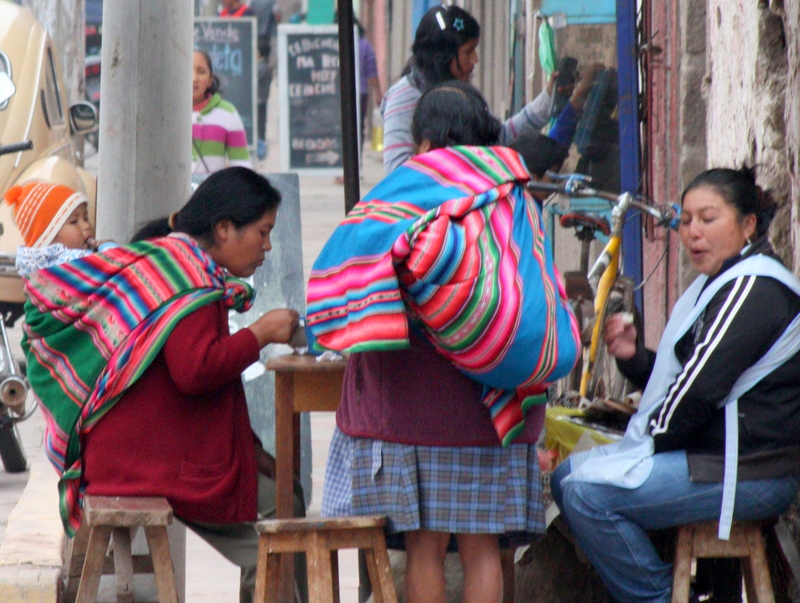 As they talk, I can hear bits of conversation conducted not in Spanish, but in the Quechua which once served as the lingua franca of the Incas’ empire. 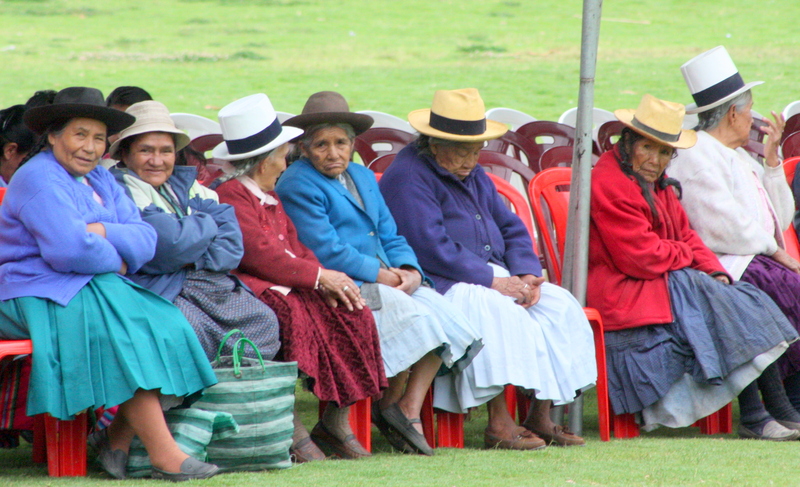 It’s the day before Mother’s Day, and village mothers have already begun to fill the seats beneath a soccer field canopy in anticipation of a public holiday observance. Yucay mothers take their place of honor before a Mother’s Day celebration. As I walk past the Templo Santiago Apostol de Yucay, an attendant opens the doors of the church… an irresistible invitation to a visit. 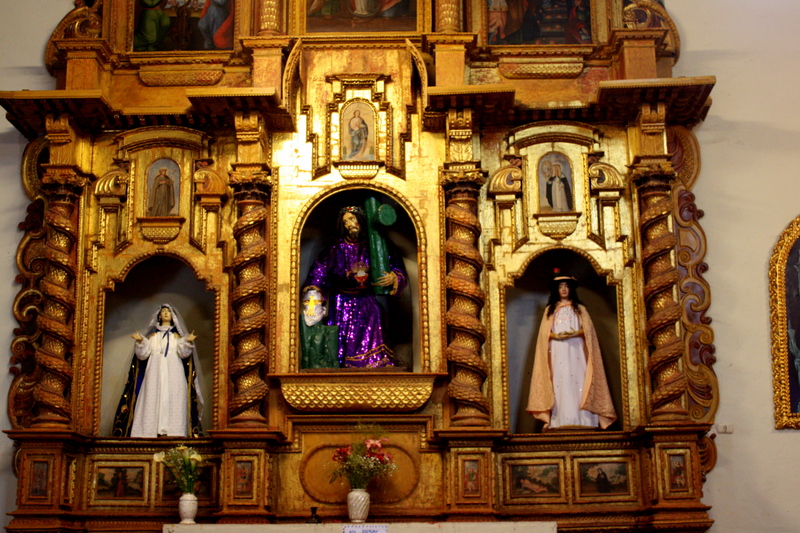 Elaborate tableau behind the altar at Templo Santiago Apostol de Yucay. The attendant proudly informs that although this church dates from 1650 – more than 100 years after the Conquest – the destruction of earlier churches by earthquakes have left this the oldest surviving Catholic church in the Sacred Valley. 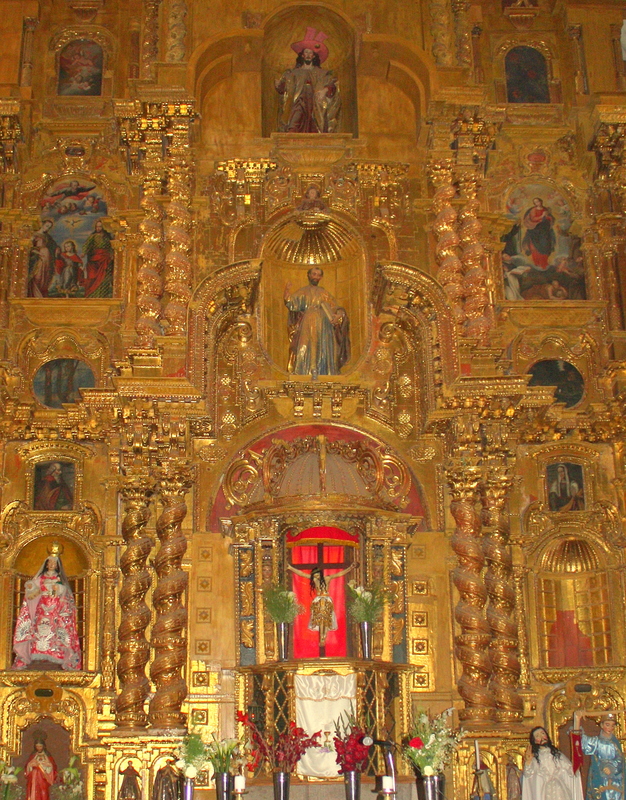 The building itself is simple and unassuming, but the altarpiece and other devotional works are carved in wood and gilded in gold and silver foil. They’re well worth the visit, even though they beg the question of wealth the church accumulated under the Conquest. 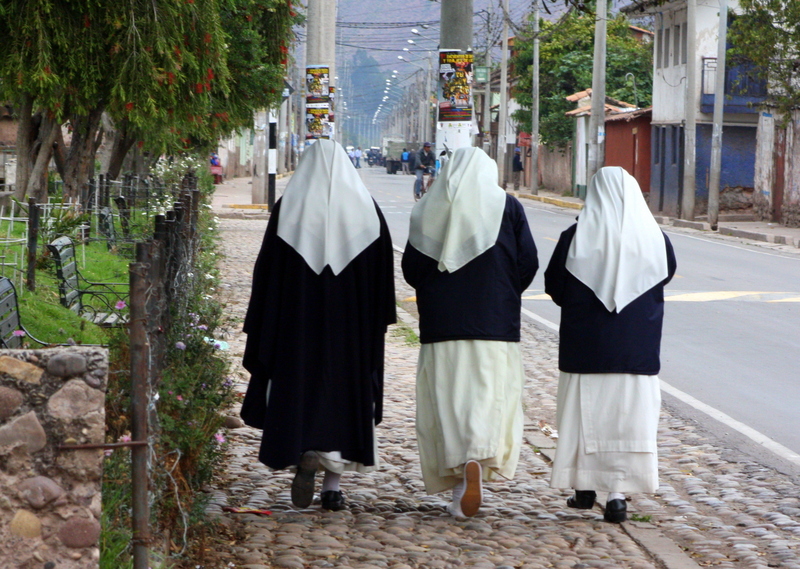 As the morning walk nears its end, I hear the chatter and laughter of women’s voices behind me and turn to see a trio of nuns, making their way along the sidewalk. It seems a fitting epilogue to the morning walk. Sisters walking Yucay’s main street. In only a few hours until the train departs Ollantaytambo station, which means that I’ll be overlooking Machu Picchu in less than 24 hours. Come along for the ride!